Day 3 at TED was a good one. 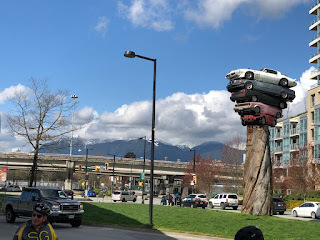 I listened to lots of good talks, rode a bike around Vancouver on a beautiful spring day, and had some good conversations with other TED attendees. If only there was more time for sleep, I would be feeling great! One thing to note, the first talk from this year's conference is now available on TED's Web site. I would not have picked Jaron Lanier's as the one to post first, but it is worth monitoring their site as the talks they think are most important begin to roll out over the coming days and weeks. The day's first session of seven talks was titled Space to dream. The talks were all interesting, but none really excited me. The most interesting ones, however, were Nora Atkinson's which showed amazing pictures of the large art installations at the Burning Man festival and Vishaan Chakrabarti's explanation of the impact of cars (wide streets and barriers to pedestrians), tall-ladder firetrucks (large intersections for turning), and wheelchairs (no steep steps or inclines) on city design and how things might change in the future as those technologies evolve. What on earth will we do? was the title of the second session of the day. 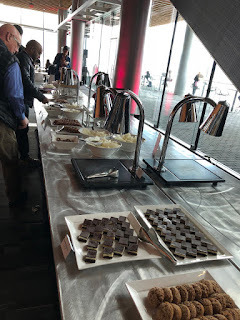 It included a number of interesting speakers like Jennifer Wilcox on the possibility of removing CO2 from the atmosphere, Angel Hsu about China's strides in battling pollution, Penny Chisholm on a microscopic organism in the oceans called prochlorococcus and its important role in the planetary ecosystem, and Rodin Lyasoff regarding Airbus' Vahama, an autonomous, electric, flying "taxi". One exciting talk was Aaswath Raman's in which he described a new material (created using nano-photonics) that allows cooling without using energy. Basically, it allows infrared light (and thus heat) to escape. I confess I could not really understand, but the impact it could have on air conditioning and refrigeration, if it can be economical, would be enormous. Enric Sala showed how oceans can recover using the example of Cabo Puloma where after only ten years of no fishing, it was teaming with fish. He showed how they can use satellite imagery and big data to see who is fishing in the high seas and how much money they are making or losing on the endeavor. They found that countries are giving big subsidies to make up for small profits. He felt that this data may be used to bring about a ban high seas fishing. The data was compelling and I hope he proves to be right. The most thought provoking talk for me was by Charles C. Mann, the author of two books I really like (1491 and 1493). His topic was the one he covers in his new book--the conflicting approaches that wizards and prophets take to solving the world's problems. Wizards are basically the technologists who think everything can be solved with technology and the prophets are those who think everything can be solved by consuming less and living closer to nature. Mann convincingly showed how the only real answer is for those two groups to work together. I will definitely need to read his new book. 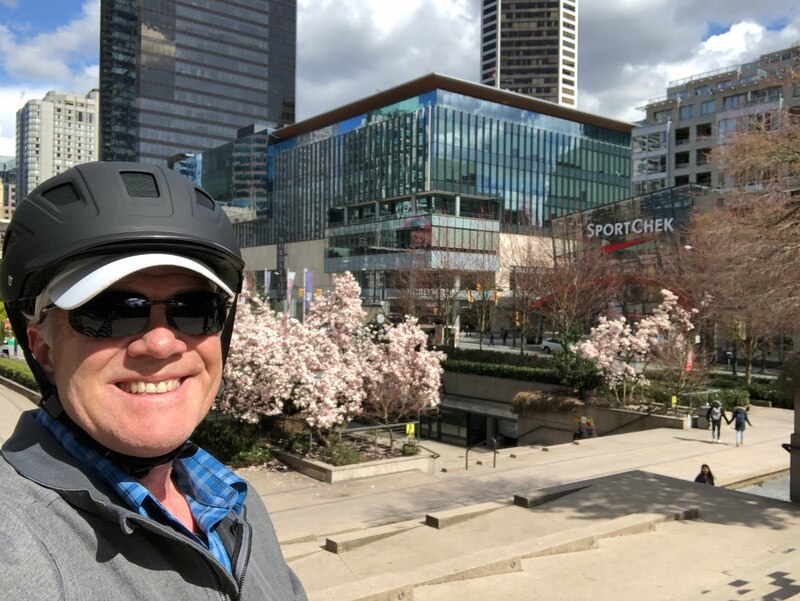 After lunch, I took advantage of one of the optional activities at TED, an 8-mile bike ride through Vancouver. There were about 30 people and the weather was wonderful--a little cool in the shade and gorgeous in the sun (which we have not seen much of so far this week). 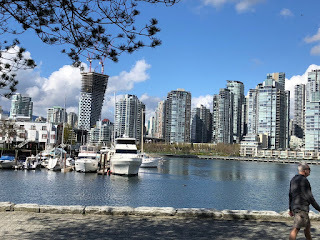 I got to explore much more of Vancouver than the few city blocks I've walked in the past. The ride was not so much exercise for my body as a welcome respite for my brain--nothing clears my head like cycling. I also had the opportunity to talk with a few folks. Near the end I got to talk with a woman in a hijab. She looked familiar, but I could not place her. For a moment, I thought maybe she was the same woman I had ridden with years ago in a quintessential TEDActive moment. She turned out to be Dalia Mogahed, a TED speaker from a couple years ago. (I wrote about her talk in 2016 that brought tears to my eyes. I would recommend you watch it if you haven't done so already.) I told her about the impact her talk had on me. It was not a life changing conversation, but it was one of those I am unlikely to have any where else. They called the final session of the day Wow. Just wow. It was a good group of talks which did have plenty of wow. The highlights for me included Pierre Barreau on how deep learning can create music. He played some music that I would not have been able to identify as composed by a computer. He told of how such AI generated music could be the soundtrack of our lives. I'm not really sure I like that idea, but the talk was intriguing. Luhan Yang described her work on xenotransplantation--using pigs to grow organs for transplantation into humans. This is something that folks have long talked about, but there are two hurdles that have been insurmountable--a porcine virus that can be fatal to humans and organ rejection. She has used CRISPR gene modification to create pigs without the virus. The next step is to work on modifying the genetics so the organs are not rejected by the human body. The results are probably ten years away, but her work is encouraging. Luke Sital-Singh sang a couple melancholy songs. The second was about his grandmother living on after his grandfather died. It was hauntingly beautiful and very moving. Alex Honnold told about his free solo climbs of Half Dome and El Capitan in Yosemite. Climbing thousands of feet without any ropes is pretty much crazy, but hearing how he did it and the dedication it required was captivating. He said that his life has been centered on climbing for over 20 years and scaling El Capitan was the best day of his life. I can't say as that I agree with either of those, but it was interesting to hear and the photos were scary enough to make everyone fidget in their chairs! Dinner was one where groups of about 15 to 20 people signed up to discuss a topic. The topic at mine was What is the future of spirituality? We had an interesting conversation, but I doubt it moved anyone's opinions. In truth, we never really agreed on the definition of spirituality, let alone truth. I felt that a few of the folks were there to listen and learn, but most had a particular idea to push whether that was organized religion is evil, Christianity is the answer, dark matter/energy will be shown to be god, love is true spirituality, or everyone just wants to be part of a tribe. I tried to listen and not be one of the people pushing an agenda, though obviously I have one. All-in-all, it was interesting, though at times frustrating. One interesting thought I had is related to TED's tag line--Ideas worth spreading. That sounds great, but I wonder if most people consider that in order for an idea to spread, it must displace other ideas. If the idea is that growth must be limited in order to save the planet, then it only spreads if people put aside the idea that growth is the goal. Spreading ideas means changing minds. I'm not sure most folks are willing to have their minds changed.